Fall Photos in Apple Orchards! This has to be one of my favorite fall photos I've ever taken. I have photographed this family several times and it is always a challenge to find a location that was new and different. Since the baby girl could sit up we decided to head to Smolak Farms in North Andover. 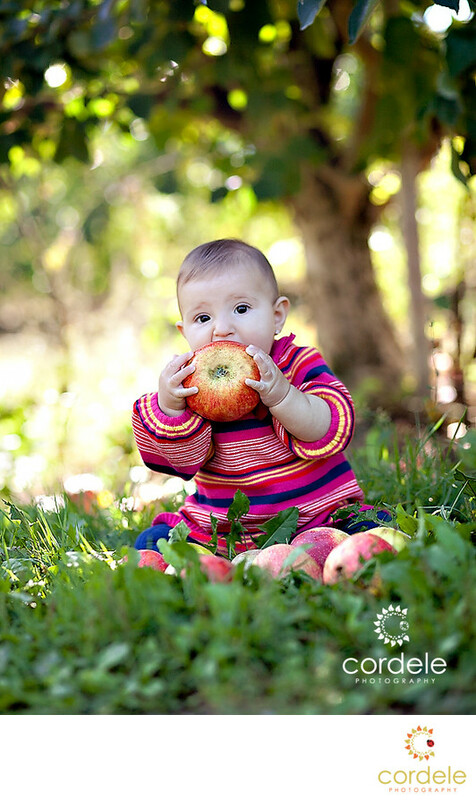 It has a fabulous apple orchard that has loads of fun places to take children's fall photos! I thought that the apple orchard was a great place and put her down under an apple tree. We piled a bunch of apples around her, and just waited. I couldn't have planned this photo any better! She picked an apple up and went to town! The lighting was perfect and her sweater brought such color to the image. I'm not a fan of the green grass/green background and so the sweater helped break up the green. I loved how the apple had an almost circular yellow on the bottom to draw your eye in. It will be a favorite fall photo of mine for a long time! Taking Apple Orchard photos can sometimes be hard with kids because they just want to play with the apples. When they bite into those apples they have to watch out for the worms! Smolak Farms is big, and my advices is to arrive an hour before your shoot and let the kids explore. There is so much to see from the pond to the apple orchard. It's also off the beaten path, so if you haven't been there before you might feel like you are driving out to the middle of nowhere. This farm has so many great things. In the winter they offer Christmas trees for sale. In the late spring they have blueberry and raspberry picking as well as peach picking and of course apples! They also have a strawberry field which could make some great lifestyle photos. I took my kids strawberry picking last year and they had so much fun!